Have you been ignoring the small puddle of oil that’s been on the garage floor? Have you been smelling a burnt oil smell from your engine? How about the smoke coming out of your tailpipe? Is it blue? An oil leak, if ignored can become a huge problem that could cost you lots of money. The oil can get on your hoses and seals which causes them to degrade prematurely. They can also be a fire risk to your engine compartment or cause catastrophic engine failure. So you see taking care of it now is important, what color is the lead? Red is probably transmission fluid, green or orange and has a sweet smell that would be coolant fluid, if it is brown that indicates an engine oil leak. What is the cause? 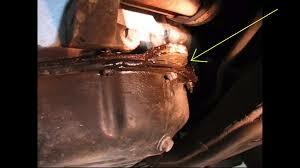 Majority of leaks are because the gaskets, oil seals, oil pan drain plug are old and cracked. How is the timing cover seal and the valve cover gaskets? Some of these you could fix yourself, don’t have the time or the know how? Lucky for you we at Ricks Auto Service here in Mishawaka, IN have some of the best mechanics, we have a 36,000 mile or 3 year warranty, give us a call.